Some people make Christmas cards all year round. Some people start in July and this is also the month that vendors have sales. So I guess you will not be surprised that FireCracker Designs also has a lovely Christmas stamp sale. Today's special set is Christmas Ornaments2. You see the set below and there is a lovely sample card in FireCrackers home page. To find the sale Christmas sets, please go HERE. All are 50% off and lovely sets for your collection. So please come by every Wednesday in July for more Christmas inspiration and wonderful sales. My sample for today is made with the digital poinsettia stamp of the FireCracker collection. I printed the stamp twice and and colored them with copic markers. One picture is the base and from the other I cut out the middle flower and used some foam tape. 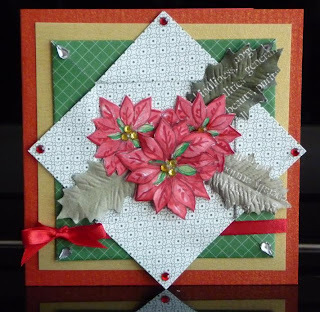 The folded frame is a tutorial I did in March, so if you click HERE you can see how to finish this card. Of course by adding some gem stones and a ribbon it made it a real Christmas card. By the time July is finished my Christmas cards are half done!